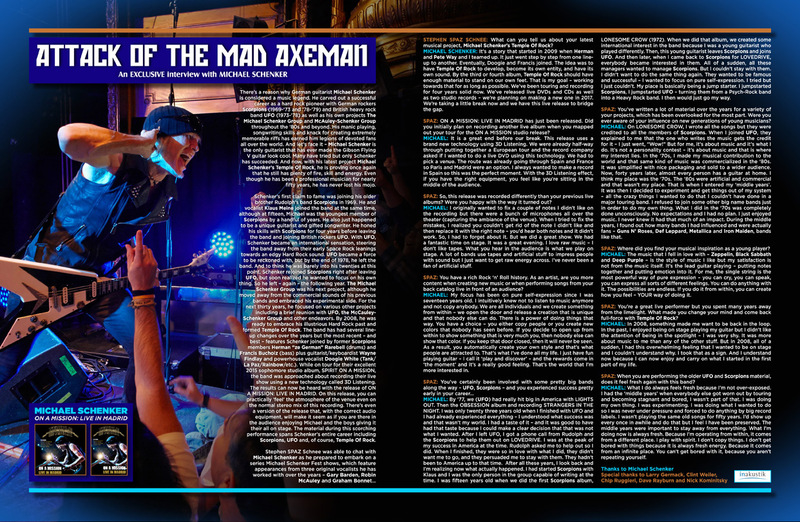 MICHAEL SCHENKER: An EXCLUSIVE Interview! There’s a reason why German guitarist Michael Schenker is considered a music legend. He carved out a successful career as a hard rock pioneer with German rockers Scorpions (1969-’73 and ’78-’79) and British heavy rock band UFO (1973-’78) as well as his own projects The Michael Schenker Group and McAuley-Schenker Group throughout the ‘80s and beyond. His manic playing, songwriting skills and knack for creating extremely memorable riffs has earned him legions of devoted fans all over the world. And let’s face it – Michael Schenker is the only guitarist that has ever made the Gibson Flying V guitar look cool. Many have tried but only Schenker has succeeded. And now, with his latest project Michael Schenker’s Temple Of Rock, he is proving once again that he still has plenty of fire, skill and energy. Even though he has been a professional musician for nearly fifty years, he has never lost his mojo. international sensation, steering the band away from their early Space Rock leanings towards an edgy Hard Rock sound. UFO became a force to be reckoned with, but by the end of 1978, he left the band. And to think he was barely into his twenties at this point. Schenker rejoined Scorpions right after leaving UFO, but soon realized he wanted to focus on his own thing. So he left – again – the following year. The Michael Schenker Group was his next project, although he moved away from the commercial sounds of his previous bands and embraced his experimental side. For the next thirty years, he focused on various other projects including a brief reunion with UFO, the McCauley-Schenker Group and other endeavors. By 2008, he was ready to embrace his illustrious Hard Rock past and formed Temple Of Rock. The band has had several line-up changes over the years but the most recent – and best – features Schenker joined by former Scorpions members Herman “ze German” Rarebell (drums) and Francis Bucholz (bass) plus guitarist/keyboardist Wayne Findlay and powerhouse vocalist Doogie White (Tank/La Paz/Rainbow/etc.). While on tour for their excellent 2015 sophomore studio album, Spirit On A Mission, the band was approached about recording their live show using a new technology called 3D Listening. The results can now be heard with the release of On A Mission: Live In Madrid. On this release, you can practically ‘feel’ the atmosphere of the venue even on the normal stereo mix of this recording. There’s even a version of the release that, with the correct audio equipment, will make it seem as if you are there in the audience enjoying Michael and the boys giving it their all on stage. The material during this scorching performance spans Schenker’s entire career including Scorpions, UFO and, of course, Temple Of Rock. The Detroit Rock ‘n’ Roll scene in the late ‘60s and early ‘70s was unlike anything else happening in the world at the time. New York was certainly tough, but there was an artistic flair that added a touch of respectability to it. The West Coast scene certainly had its moments, although the hippy-dippy flower-power movement took away some of its thunder. But Detroit? It was a hotbed of unbridled energy, attitude, and bravado. While Motown was in many ways the soul of Detroit, the Rock ‘n’ Roll rumble in the streets was loud and often frightening. But it was also invigorating and electrifying. It was raw and pure. It was Garage Rock with the power of Punk and Metal (neither of which were musical genres at the time!) yet it could also be artsy like the East Coast, and hippy-dippy like San Francisco and L.A. It was a melting pot of attitudes and ideas. And it was where the Grande Ballroom was born. Unlike any venue before or since, the Grande was not just a concert hall – it was a meeting place for creative minds, disenchanted youth and people of all race, class, and creed. It may have promoted shows by local and touring bands, yet it also embraced the sexual revolution, psychedelia, the drug culture, and, most importantly, freedom of expression. The club Detroit bands like MC5, The Stooges, The Frost, The Third Power and SRC were regulars, while The Who, Pink Floyd, B.B. King, Led Zeppelin and many other major bands would always play there while on tour. The Grande became THE venue to play for every major Rock band once they had already conquered the East and/or West Coast. For some, it was even more important! The Grande was the brainchild of Russ Gibb, who some remember as one of the instigators of the ‘Paul Is Dead’ hoax of the late ‘60s (or was it a hoax?). Along with controversial counter-culture figure John Sinclair, they turned an old 1920s dancehall into something truly mind-blowing. Although the Grande shut its doors more than four decades ago, it remains one of Rock’s most iconic venues. The power and glory of the Grande Ballroom may be part of Detroit’s – and Rock ‘n’ Roll’s – history, yet the larger-than-life venue’s tale remained largely untold. Director Tony D’Annunzio has addressed that situation with Louder Than Love: The Grande Ballroom Story. An emotional rollercoaster-ride of a documentary, Louder Than Love opens up the doors of the Grande and allows the main players to tell their story with passion and honesty. This is not just a documentary about a Rock ‘n’ Roll venue; this is a film about how music and art can make a difference in the world. Alongside members of the Grande’s inner circle and Detroit icons (Russ Gibb, John Sinclair, MC5’s Wayne Kramer, Alice Cooper, The Amboy Dukes’ Ted Nugent), there are also interviews with legendary artists like Roger Daltrey (The Who), Lemmy (Hawkwind/Motorhead), B.B. King, Don Was and many others. This is a story that needed to be told and Louder Than Love is a triumph in every way. Swedish trio Peter Björn and John have created a musical universe that is constantly evolving. However, they’ve managed to retain their unique charm that made them press darlings a decade ago with “Young Folks”. What many didn’t realize is that that hit’s parent album, Writer’s Block, was the trio’s third in a career that has seen them stretch the boundaries of Pop music. While Top 40 radio’s Pop guidelines are pretty rigid, Peter Morén, Björn Yttling and John Eriksson treat them like elastic rubber bands, bending and twisting those guidelines into new and exciting aural avenues. They’ve even managed to carve out musical careers outside of PB&J while never lowering the quality control level on the albums they record together. And can you believe they even collaborated with Canadian hip hopster Drake a handful of years before he became a musical sensation? Breakin’ Point, their first album in five years, finds PB&J offering up a collection of songs that are so instantly lovable that you’ll swear you’ve been in love with them for years. Every track on the album is a potential hit single – the melodies leap out and grab hold on the first spin. Their songwriting is based in classic ‘60s, ‘70s and ‘80s Pop/Rock, but the production, arrangements and inventiveness is thoroughly modern if not outright forward-thinking. They’ve sidestepped the experimental moodiness of some of their past albums and embraced their more playful side. This isn’t an album that tries to revisit their past glories – it creates new ones. It is 2016 and The Monkees are celebrating their 50th Anniversary the very same year I celebrate my 50th Anniversary as a Monkees fan. Way back in 1966 when the TV show first aired and the band had their first hit single (‘Last Train To Clarksville’), I was coming up on my third birthday and my brother was nearing his fourth. My parents sat us down in front of the television and introduced us to a quartet that instantly became our second favorite band (after The Beatles, of course). Mom and Dad often said that the thirty minutes The Monkees were on was the ONLY time during the week when they didn’t have to worry about us getting into any trouble – we were glued to the tube and thoroughly enjoying their zany antics and great songs. ALLIANCE ENTERTAINMENT ACQUIRES ANCONNECT RETAIL MUSIC BUSINESS! In a transaction signed on May 18, 2016, Alliance Entertainment Holding Corporation (“AEC”) and ANconnect, LLC (“ANC”) have entered into a purchase agreement whereby AEC will acquire the ANC retail music assets and business. AEC, the largest wholesale distributor of physical home entertainment audio, video and software in the United States and best-in-class distribution solutions, provides a high level of service in various disciplines including; mass merchant retail and wholesale distribution, consumer direct services, vendor managed inventory systems and independent music store fulfillment. The transaction brings an expanded assortment of products to ANC customers, which includes product lines of CD, vinyl music, and electronic products from AEC’s current 480,000 in stock SKU base. TRAIN Does Led Zeppelin II: Available June 3rd, 2016! Train, the San Francisco-based Rock/Pop band led by Pat Monahan, will release Train Does Led Zeppelin II (via Crush Music/WEA) on June 3rd , 2016. On this release, Train performs the entirety of the 1969 sophomore album by Led Zeppelin, one of Rock’s greatest quartets. The Train album’s nine-song track list mirrors the original Zep release from first track to last. This bold artistic move will present Train in a new musical light as well as introduce their audience to a classic album that wrote the blueprint for Blues-influenced Hard Rock. While it is not a complete surprise, many were flabbergasted to hear that Rovi, a company known for creating personalized and data-driven ways for viewers to discover the right entertainment and for providers to discover the right audiences, has acquired TiVo, the global leader in next-generation television services. If you think for a moment that you will no longer be able to easily record episodes of Dancing With The Stars and Dr. Phil, think again. In a nutshell, this means that, for the average user, TiVo will only get better. Here is a small portion of the official press release. Hopefully, it helps you in understanding this unique and very exciting acquisition. The entertainment world is continually changing so you better get with the program. Or you can just TiVo it and get back to it later!